This isn't your average ergonomic computer keyboard. 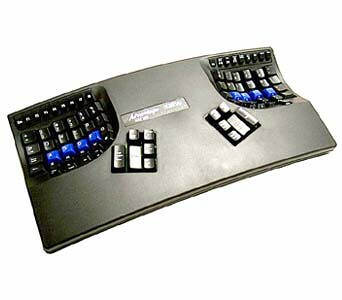 The basic Programmable Advantage USB Ergonomic Keyboard is the most innovative design we offer and comes with an unmatched 2-year warranty. It's an ergonomic, bowl-shaped wonder designed to place Shift, Enter, Function and thumb-operated keys in their most appropriate positions, which lessens reaching and reduces stress on hands, arms and wrists. It reduces localized stress and provides good support for workers with injured or overused wrists. Smart, programmable function keys make it a programmer's favorite, one that makes a day of coding infinitely easier on your body. ..